Students save money when purchasing bundled products. 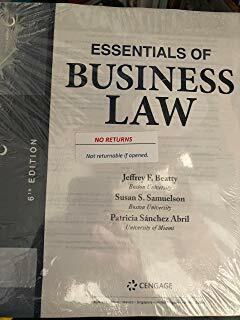 This bundle contains a loose-leaf version of Essentials of Business Law, 6th Edition, and access to MindTap Business Law for 1 term (6 months). With a single login for MindTap, you can connect with your instructor, organize coursework, and have access to a range of study tools, including e-book and apps all in one place! MindTap helps you learn on your terms. Read or listen to textbooks and study with the aid of instructor notifications, flashcards, and practice quizzes.